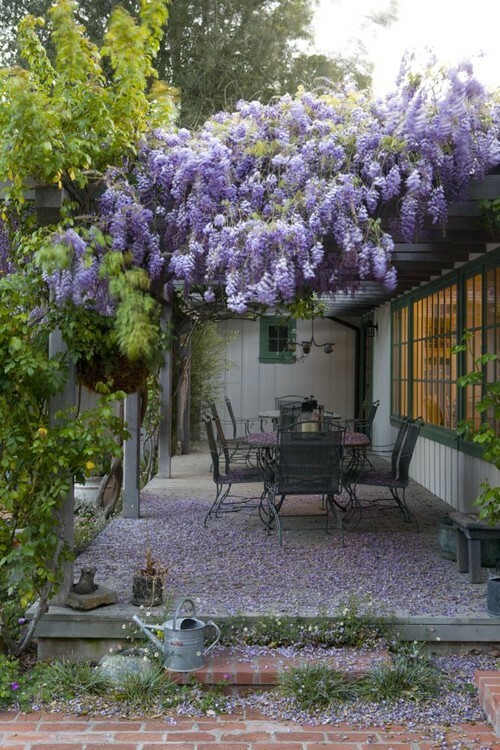 You’ve probably seen beautiful pergolas in magazines and on television, often covered in vines or flowers. Pergolas are an ancient garden structure providing a shaded walkway or sitting area. 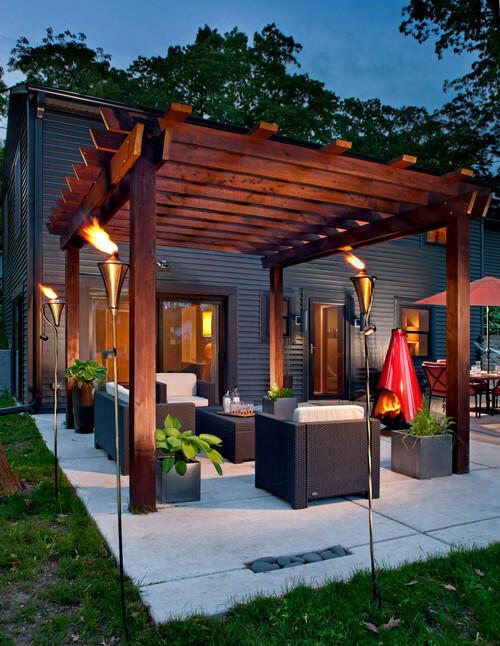 A pergola is a powerful addition to your yard, but it can be tricky to set it up right. Here are a few tips for adding a pergola to your property. 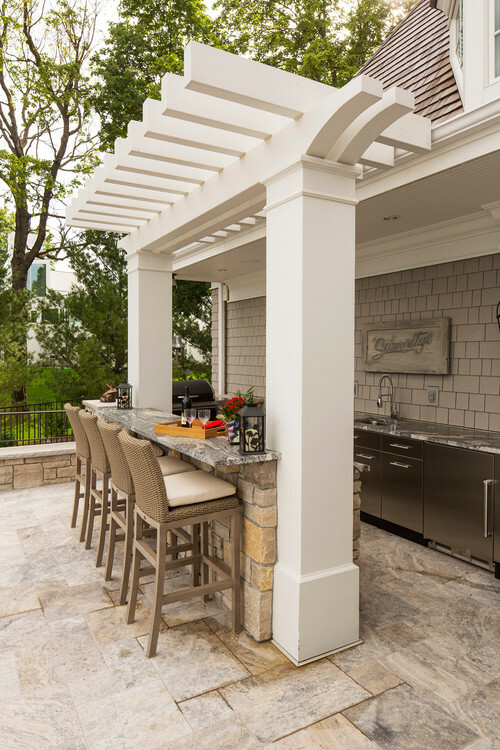 Decide up front how the pergola will serve your property: decorative, a transitional element between two areas, or a functional seating area. Decorative pergolas can stand alone in a yard or be tucked into a corner or side space. They can also be small, with a footprint of only a few square feet. Decorative pergolas are often delicate, made with thin wood or metal. Photo by Great Oaks Landscape Associates Inc. 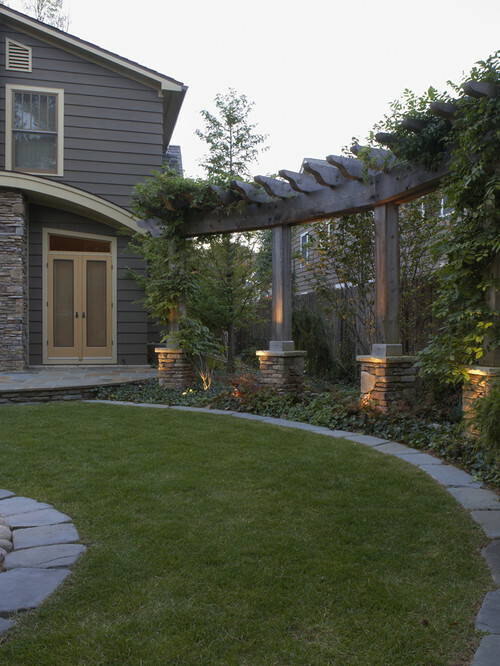 Transitional pergolas can serve as a doorway between two areas, such as between a garden and a lawn, or a lawn and a patio. They can cover the length of a walkway, stretching for hundreds of feet. 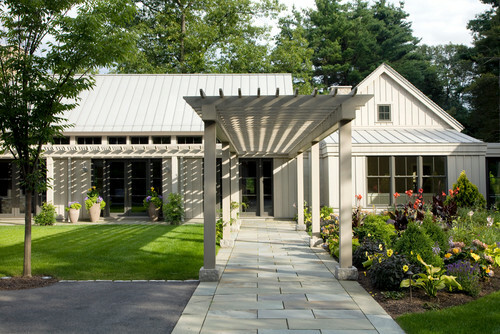 Your pergola should harmonize with your home and outbuildings. Think about its style and size—it should be large enough to make a statement of its own, but it shouldn’t overwhelm its setting. Its materials should echo your home’s architecture. Pergolas don’t have to be the traditional wood, brick, or stone—contemporary pergolas are available in fiberglass, aluminum, steel, and other materials. 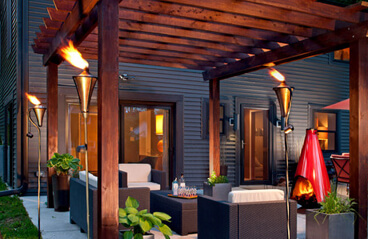 For seating-area pergolas, choose outdoor furniture that complements the style of your pergola. You can match in a few ways—material, frame color, design style, or seat cushion color. Because your pergola is already harmonized with your home, anything you match to the pergola will automatically complement your home and property. What to grow on the pergola? Climbing vines are ideal, either flowering or non-flowering species. Wisteria is a classic choice, as is the broad-leafed Niagara grapevine (with edible fruit, a nice bonus!). Specialty grasses around the base of your pergola can help create a transition between the lawn and the structure. First off—you don’t have to do it yourself! Landscapers can install pre-built pergolas or construct custom pergolas from scratch. 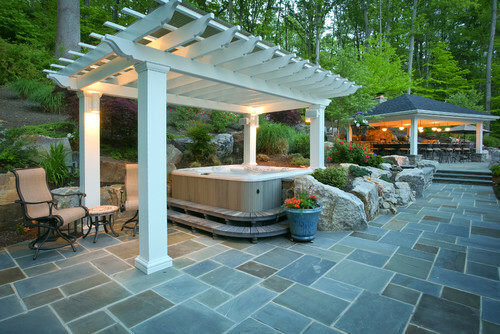 They can also help you figure out the best pergola for your property. If you want to do it yourself, you can build one using a design or create your own. You can also buy finished pergolas and kits from stores or local builders. When you’re ready to furnish your pergola, check out our selection of outdoor stools and furniture from top designers like Tobias, Lisa, and more. Enjoy the good weather!